Born in 1949 with Down's Syndrome, Tomasz Sitkowski was not expected to survive his early years. However, after overcoming many hardships, his parents soon recognised the remarkable calming effects of music on the young child, and began to take Tomasz to concerts and the opera. 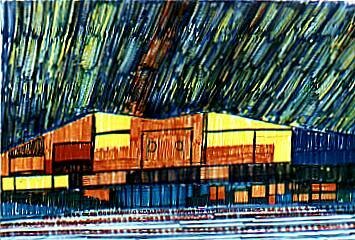 At the age of fourteen Tomasz started to draw, his theme, to be repeated obsessively over the subsequent years was the concert hall and its music, expressed through a dynamic use of colour. He can only create his art whilst listening to his treasures tape player. His love of music, thus reified, has become his main form of expression and communication with the outside world. In 1985 Tomasz Sitkowski's case history and art was discussed at an international conference on the mentally handicapped in New York. 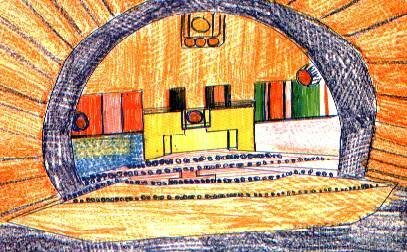 His self-taught drawings are in the permanent collections of the Ethnographic Museums of Radom and Wroclaw and have been widely exhibited in over sixty shows since 1968. He is also included in Professor Aleksander Jackowski's definitive book on Polish naive art. Tomasz's extraordinary drawings in coloured inks are currently available exclusively through the Henry Boxer Gallery.